The world’s biggest arms company, Lockheed Martin, is a key player in the UK’s nuclear weapons industry. It manufactures the missiles and manages (along with Jacobs and Serco) the nuclear bases at Aldermaston and Burghfield where the warheads are designed, manufactured and refurbished. 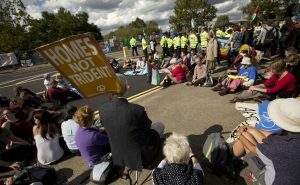 Another huge arms company, Rolls Royce, manufactures nuclear fuel rods at their plant in Derby. The involvement of these companies in the UK nuclear deterrent allows them a huge amount of influence over the government, which in turn seeks lucrative export deals for them. All of these companies were at the arms fair in 2015 and plan to be there again this September. 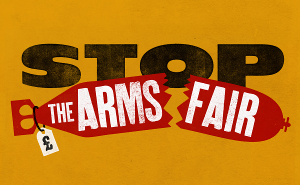 Join the action saying no to nuclear weapons and no to the arms fair. Lockheed Martin – Lockheed Martin is the main partner in AWE-ML, the company that manages the UK’s Atomic Weapons Establishment (AWE). The AWE is responsible for the maintenance of the warheads for the UK’s Trident nuclear arsenal and manages and operates the AWE sites at Aldermaston, Burghfield, and Blacknest. BAE Systems – BAE Systems is the biggest UK arms company and subject of successive corruption and bribery investigations, it will provide the submarines that will replace the current ‘Vanguard’ subs that carry the UK’s Trident nuclear missile system. It is also the prime contractor for the US Minuteman III Intercontinental Ballistic Missile (ICBM) system and part of the joint venture providing medium-range air-to-surface nuclear missiles for France. Thales – Thales is part of a joint venture to build the M51 submarine-launched nuclear missiles for the French navy. Aerojet Rocketdyne – Aerojet Rocketdyne produces solid and liquid propulsion systems for the Minuteman III and Trident II (D5) (UK & US). General Dynamics – General Dynamics provides a range of engineering, development, and production activities to support to US and UK Trident II Strategic Weapons Systems. It is also involved in the guidance systems of the Trident II (D5) nuclear missiles of the US Navy. MBDA Systems – MBDA Systems is a joint venture between BAE Systems (37.5%), Airbus (37.5%) and Leonardo-Finmeccanica (25%). It supplies the medium-range air-to-surface missile system that deliver much of the French nuclear arsenal. Moog – Moog developed the launch vehicles and strategic missile controls for the Minuteman III (US) and Trident (D5) (US & UK) missiles. Northrop Grumman – Northrop Grumman has provided the original launcher system of the Trident II (D5) since the 1980s. In December 2013 it was awarded a US$ 112.9 million (€ 82.5 million) contract for ongoing support to the Trident II (D5) Underwater Launcher System and Advanced Launcher Development Program Support for the US and the UK. Together with partners Babcock & Wilcox, Aecom and CH2M Hill (also exhibiting at DSEI 2017), is a joint venture partner in National Security Technologies (NSTec). Since 2006, NSTec manages the Nevada National Security Site (NNSS), previously known as Nevada Test Site. Safran Electronics & Defense – Safran Electronics & Defense is part of a joint venture to build M51 submarine-launched nuclear missiles for the French navy, which each deliver multiple warheads. Its subsidiaries Snecma and Sagem provide the propulsion and navigation systems for these missiles. Rolls Royce – Rolls Royce worked on propulsion systems for UK nuclear submarines as well as producing nuclear fuel rods at their plant in Derby. Raytheon – Raytheon is currently involved in a project to stretch the lifecycle of the guidance systems of the Trident II (D5) nuclear missiles of the US Navy. It is also involved in studies in support of the new W80-4 Long-Range Standoff missile for the US arsenal.